Unfortunately, Mr. Borenstein has the story wrong. The computer model is not new. We've (AccuWeather Enterprise Solutions) been using the computer model in question, the HRRR, for several years. I used the HRRR model to display peak gusts during Hurricane Sandy on this blog. Here is an example of the HRRR model in its simulated radar reflectivity mode. 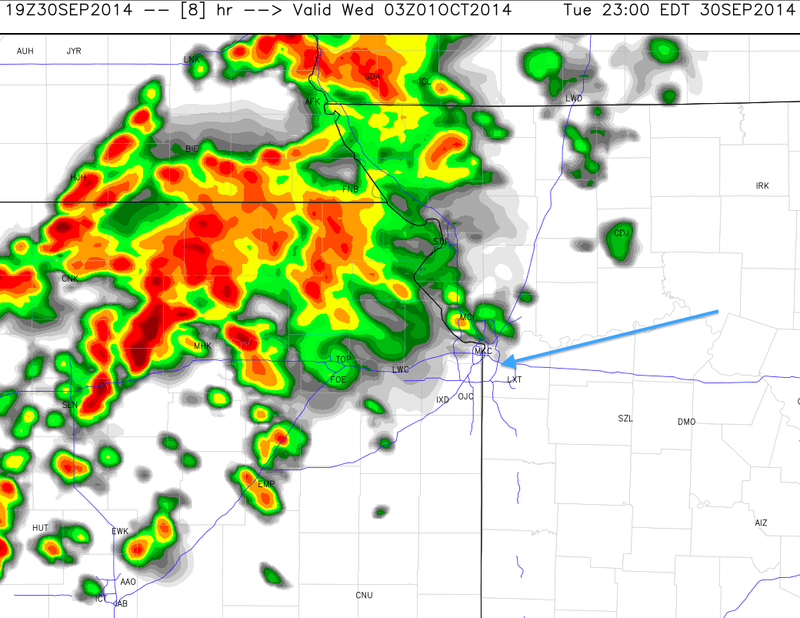 This is the forecast for 10pm CDT this evening. I have marked the location of the Truman Sports Complex and Royals Stadium for tonight's Kansas City Royals vs. Oakland (formerly Kansas City) Athletics. It is forecasting a shower over north Kansas City but not over the stadium before 10pm. If the HRRR is correct, the game should be fine unless it goes into extra innings. 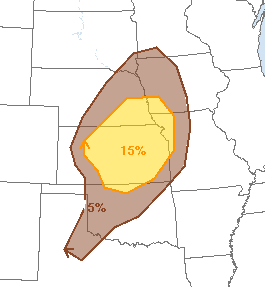 Latest update on tomorrow's severe thunderstorm and tornado risk. 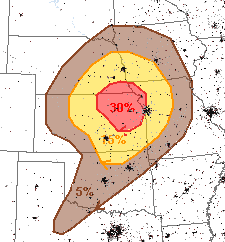 The significant risk area is 15% and higher. 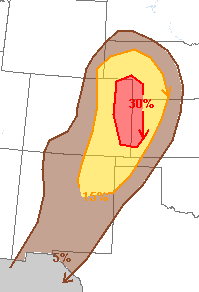 If you live in the yellow or red areas, I urge you to keep up on the weather tomorrow. On Thursday, the threat morphs into one of mainly damaging thunderstorm winds. If you are looking for an awesome read, give 5-Star rated Warnings a try! You can read the first chapter (free) by clicking here. If you live in these areas, please keep an eye out as thunderstorms approach. 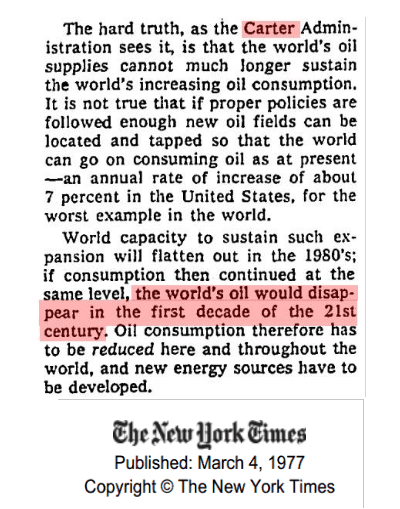 Because of its pertinence to the climate discussion ("we are running out of conventional fuels"), I am linking to a Wall Street Journal story that peak oil is likely a myth. Just like ingenuity and technology have beaten peak oil, global warming is a manageable problem and will be managed just like other environmental challenges of the past. Forecaster Evie is in the weather station and is keeping a weather eye out the next few days as tornadoes and severe thunderstorms are possible. She has her phone and is ready to call in any reports of damaging or dangerous storms. 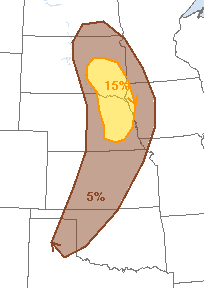 People in the 5% (brown) area should keep a close eye on approaching thunderstorms. 15% is the significant threshold. Especially if you live in the 30% area, go ahead and bring lawn furniture, trampolines, etc., indoors before the thunderstorms arrive. Again, 15% is the significant threshold. You may want to put your car in the garage if thunderstorms threaten. 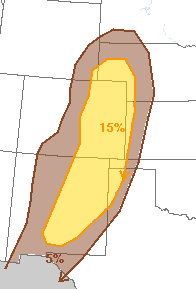 There is a risk of large hail and damaging winds with 15% the significant threat threshold. There could also be a tornado or two in the yellow area. 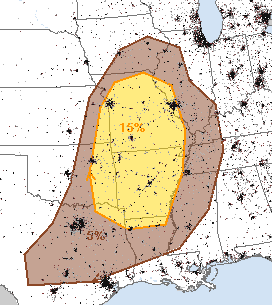 Perhaps the highest threat for tornadoes this week is Wednesday. While the official numbers are not much higher, I think conditions are coming together in the Central Plains for several tornadoes on Wednesday. At this point, I'd suggest anyone in the area with 5% or higher numbers to follow Evie's example and keep a weather eye out. VILLA PURIFICACION, MEXICO — It wasn’t even sprinkling when a lightning bolt slammed into Herasmo Palafosa as he played dominoes, chatting with friends under a mango tree one moment, a lifeless heap the next. Herasmo was killed by what meteorologists call the "first bolt" -- the first bolt from a cumulonimbus cloud -- rather than from an ongoing lightning storm that traveled to Villa Purificacion. I've seen research that estimates in the United States a disproportionate number of people are killed by first bolts and this could well be the case worldwide. Existing lightning warning systems work well (thus the record low deaths, so far, in the U.S. this year in spite of cases of poor awareness) but we still have work to do. AccuWeather Enterprise Solutions offers excellent lighting warning services for businesses and their employees in the U.S., Canada, and Mexico. However, that tragically does not cover individuals like Herasmo because the infrastructure does not exist to get warnings to individuals in rural areas. I did not know so many people were killed worldwide. The McClatchy story is well worth your time. 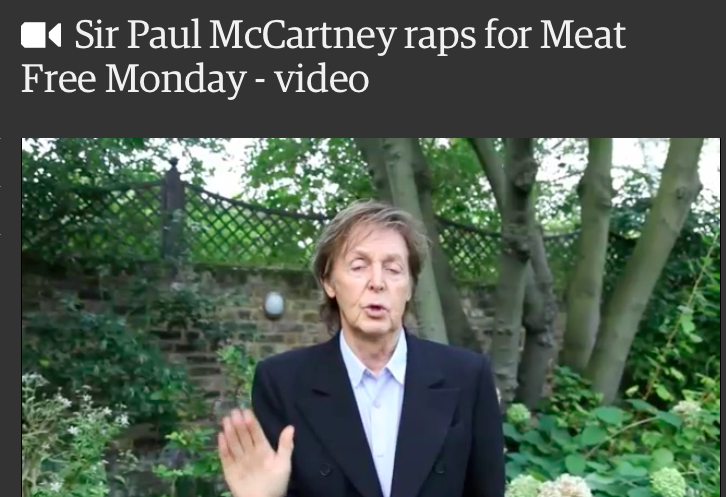 If we were personally acquainted, I think I'd like Paul McCartney. But, I'm getting tired of his sermonizing about vegetarianism. The latest excuse? Global warming. If you want to see it, it is here. Another reader posted a 5-Star Review at Amazon yesterday. 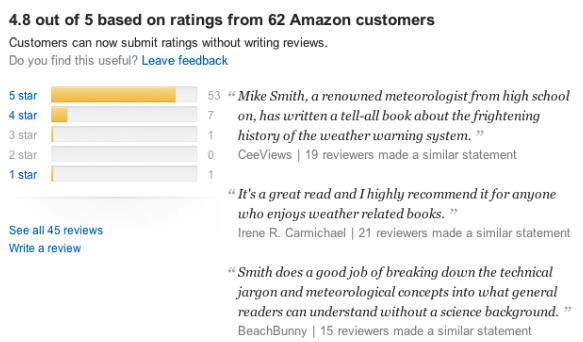 Warnings is one of the best-reviewed books about weather in recent years by both critics and readers. Why Can't the FAA Be More Like the NWS? The Chicago Tribune is reporting this morning that more than 500 flights have been cancelled at O'Hare (alone) and presenting that in positive terms after more than 2,000 flights were cancelled yesterday. More flights were cancelled at Midway. I think the Trib is being too kind. All of this brings up a very simple question: Why does the Federal Aviation Administration keep failing, over and over, to update the air traffic system? In the National Weather Service, a situation like yesterday's would be handled by an adjacent NWS office. I've watched their backups work well in real time on a number of occasions. As I have stated on many occasions, the NWS provides tremendous value for the taxpayers' investments (see here and here, for just two examples). Both Canada and New Zealand have privatized their air traffic control systems with great success. After decades of utter failure by the FAA, it is time to seriously consider the United States do the same. At the very minimum: Under federal law, mission critical U.S. public companies must have tested, working backup systems. Let me explain why this is. The FAA's airport observations (as opposed to the NWS's) all go through "the Kansas City switch" -- a computer in KC. I always thought there was a line from the Aurora Center and a line directly to the switch. Apparently not. Another FAA single point of failure. When I was in my teens, I would see these clouds, look at my cloud chart, and see nothing like them listed. I thought I was misinterpreting the chart. As it turns out, this type of cloud -- undulatus asperatus -- while occurring since the beginning of time, was not identified as a unique cloud type until 2009. The Capital Weather Gang has a nice story on this and how the cloud needs to be added to the list of official cloud types. Via Twitter, a shot from a high school football game in Utah. 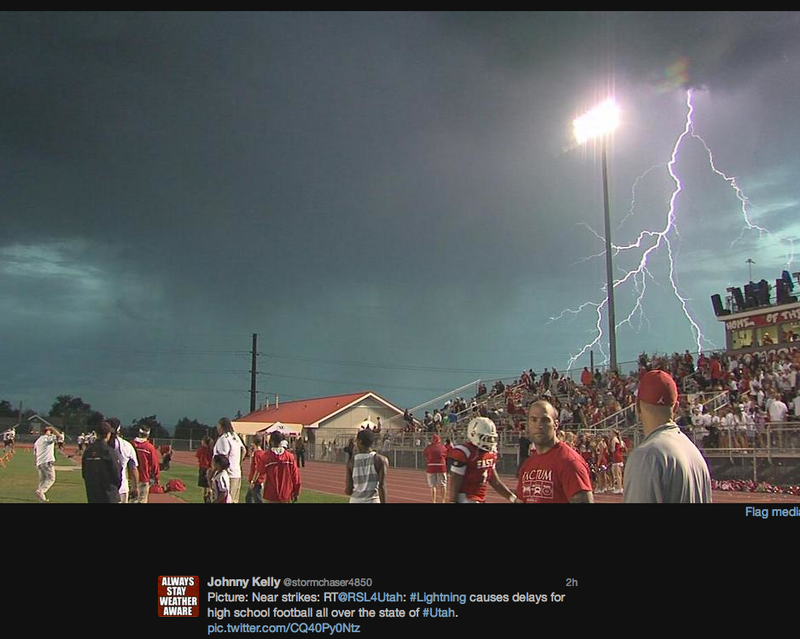 Yes, lightning during a football game in Utah is rare but the storm should not have been allowed to get this close. What Did He Think It Was, The White House? 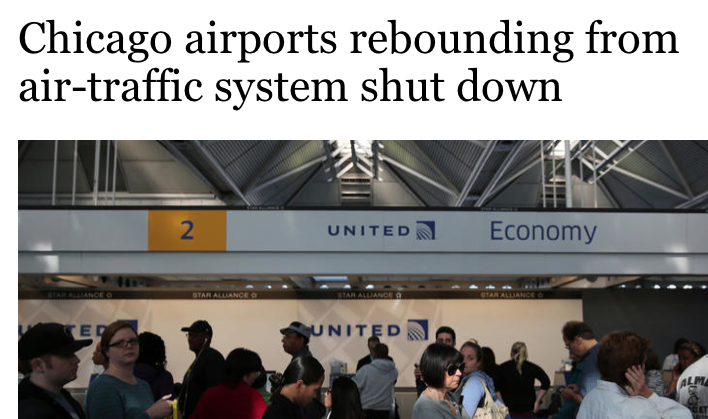 The above headline is from The Chicago Tribune and tells about a "non-employee" getting into the Aurora Air Route Traffic Control System disrupting literally hundreds of flights across the United States. This is less than a week after a man got into the White House by jumping over a fence. So, knowing that terrorists target aviation and that the White House and U.S. Capitol are the very symbols of our nation, what is our crack Department of Homeland Security doing this week? "Increasingly, we've moved not only from a security focus…" I'll bet if you polled 100 Americans at random, not one would be recommending DHS tackle 'climate change.' Classic mission creep. The DHS needs to be abolished. It is nothing but "security theatre"and oblivious to the real threats our nation faces. 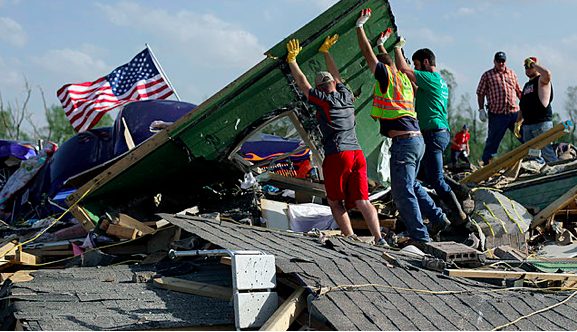 The paper, Tornado Activity is Occurring Earlier in the Heart of “Tornado Alley” brings up some interesting points about the peak of tornado season occurring earlier in the spring in the conventional “tornado alley” of the Great Plains. The paper is an attempt to link global warming to a change in tornado season between 1954 and 2009. Its primary conclusions appear sound. 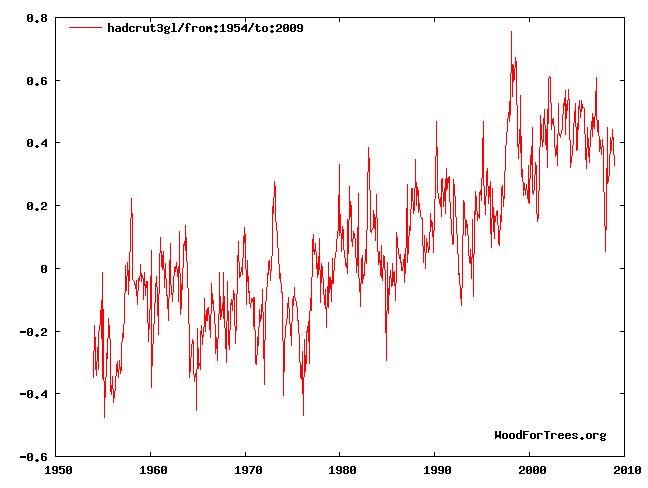 That result is not surprising given the rise in global temperatures during that period of time (see graph). My objections are not with the primary thrust of the paper. It appears to be a useful addition to the literature. My objection is the paper’s attempt to make the change in the time of the peak tornado season into something sinister. For example, the first sentence in the paper (it appears in the Abstract) is, “Tornado frequency may increase as the factors that contribute to severe convection are altered by a changing climate.” It also says, “The lack of evidence is due in part to sampling effort: the number of reported tornadoes has increased over time [Dixon et al., 2011].” The reference to Dixon has to do with Dixie tornado alley, not the one in the Great Plains. 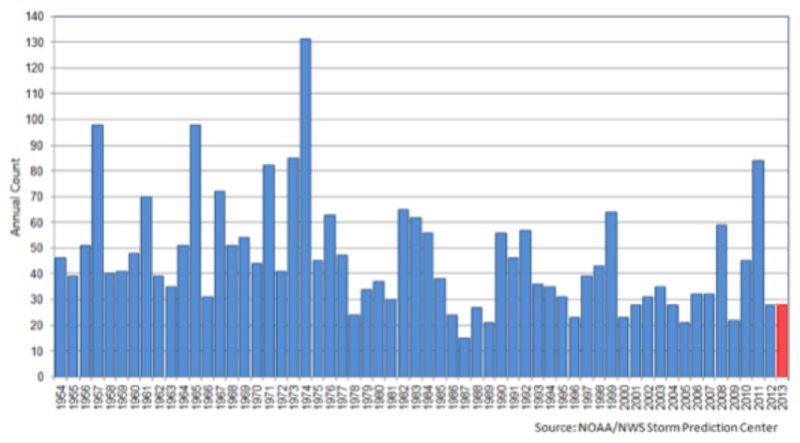 Even though world temperatures have risen, there is absolutely no upward trend in tornadoes. This is especially surprising given the storm chase program that started in 1972 and Doppler radar installations beginning in 1991. There are many small tornadoes that now get into the books that never would have been recorded a half-century ago. 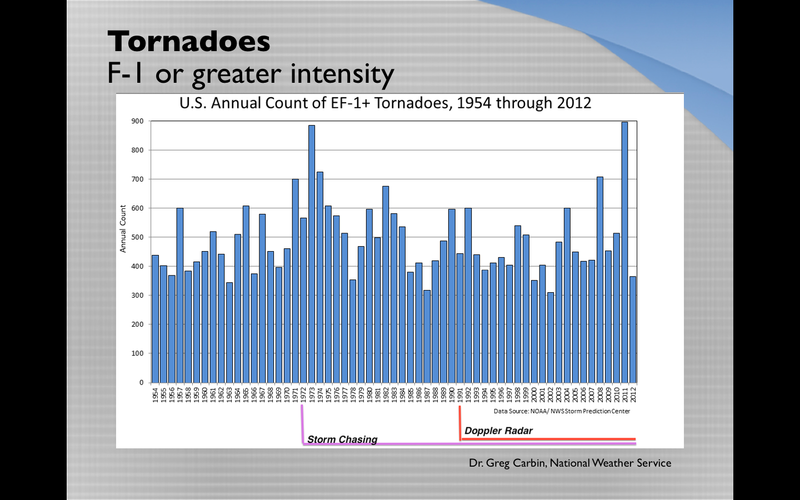 In the case of tornadoes of F-3 or greater, there is a surprising downward trend. Since the Fujita Scale is a damage scale, meteorologists believe we have a reasonable grasp of the number of strong tornadoes since the mid-50’s. This is the first time non-scientific techniques have been used to try to produce the 'global warming produces more tornadoes' result. A 2013 paper, Robust Increases in Severe Thunderstorm Environments in Response to Greenhouse Forcing, mis-stated the findings of a United Nation's report on severe storm to get around the fact that, so far, warmer temperatures have meant fewer tornadoes. Instead of accepting what the data says, research have distorting the record to try to tie more tornadoes to global warming. And, unfortunately, journalists (which seem to unquestioningly accept anything the pro-global warming advocates publish) allow them to get away with it. Mike and I just got back from the NAMIC 2014 Annual Convention that was held at The Gaylord National Resort and Convention Center in National Harbor, Maryland. 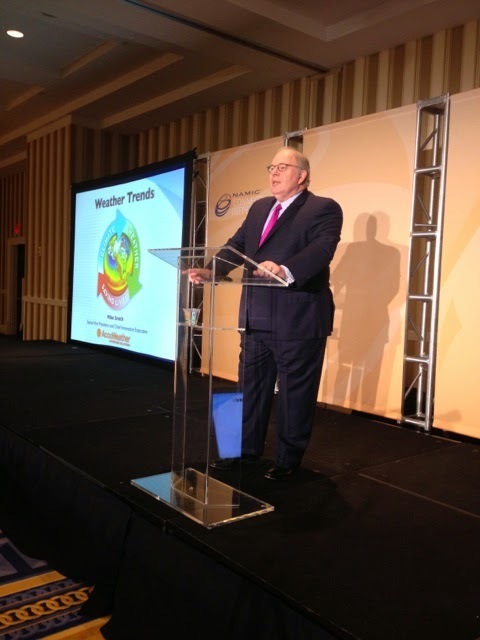 The title of Mike's presentation was Weather Trends on how weather and climate effect the insurance industry. With all the interest in global warming in the news recently, Mike brought up the subject of global warming and made it a politics free climate trend discussion based on the facts that world temps have not warmed or cooled since 1998. Mike speaks with out notes and reassured the audience that although the seas are slowing warming since 2001, they are increasing at a lower rate than first predicted. Over all, hurricanes are down and there is not upward trend at all in violent tornadoes, reminding the audience that F-5 tornadoes are quite rare. Mike is still concerned with finding better ways to communicate to the public the importance in heeding the warnings to save lives. Hurricane prediction is better than what it was 25 years ago but he added, we still need to do a better job at preparing the public. Drones could add greatly to our understanding of hurricanes but they must first be able to withstand a category 5 hurricane to prove effective. All the members of the audience were given a copy of Mike's book WARNINGS: The True Story of How Science Tamed the Weather. In many ways, public health is where meteorology was eight decades ago when it comes to forecasting disease. Almost all art, little science. AscelBio (note: I am an investor and advisor) is trying to change that by offering science-based forecasts of the extent of disease. More here. Ebola is a huge public health challenge. I agree with the editorial: The United States can do better. 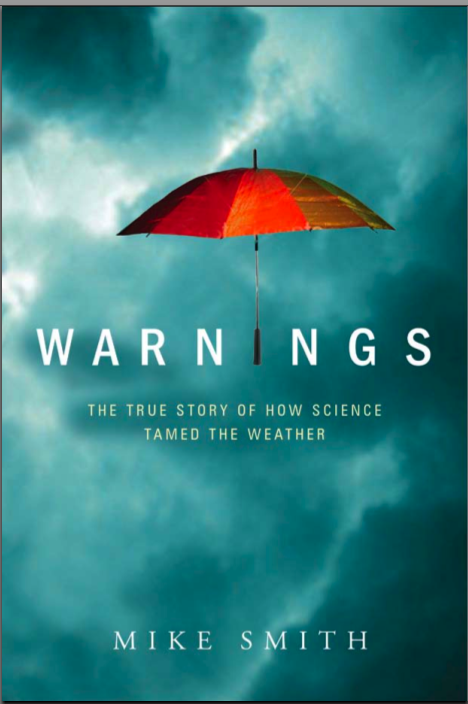 These notifications keep popping up on the internet: A "free" copy of Warnings: The True Story of How Science Changed the Weather. When you click on the link, you don't get Warnings. You get malware for your computer! If you wish to download the real book, just click here. 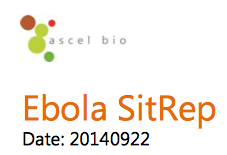 From the experts at AscelBio. AscelBio's mission is to forecast disease outbreaks in much the same way meteorologists forecast storms. More on AscelBio here. 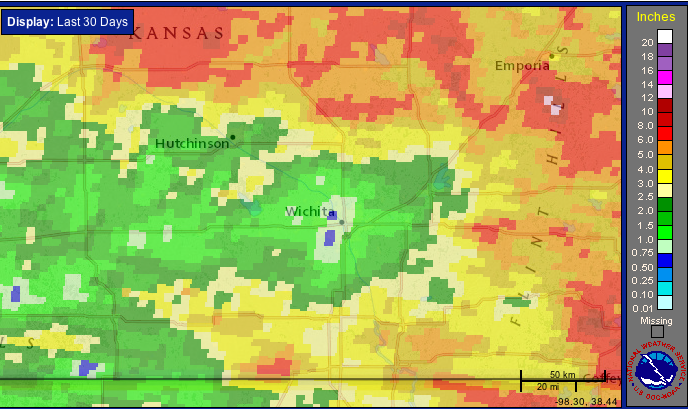 I try not to post too many Wichita-centric items on the blog but the rainfall pattern of the last 30 days is worthy of comment. Some people talk about rainfall "holes" for their cities. In the case of Wichita the last month, it is literally true. My yard is in the "hole." There is no climatological reason for this, it is just coincidence. I'll be happy when our luck returns. A flash watch is in effect for the Washington, DC area. More from AccuWeather. Really like the well-marked storm shelters at Baltimore-Washington International Airport. Article from AccuWeather quoting my friend and building expert, Tim Marshall. "'Organizers' Estimated 310,000" No Wonder They Believe the Global Warming Hype! It is no wonder they believe the hype about global warming: They are obviously math-challenged. Here is the photograph the organizers tweeted to prove there were 310,000 people there. The narrow crowd looks like it extends about four blocks to Columbus Circle. The crowd thins out significantly as you view the upper part of the photo toward the circle. With no other information, that doesn't look anywhere near 300,000 but let's do a comparison. 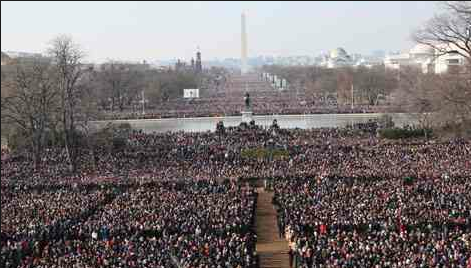 The Washington, DC police (not the 'organizers') estimated 300,000 people attended the Tea Party March in 2009. Here are a couple of photos of that crowd. Note that it is far, far larger and extends to both sides of the reflecting pool. 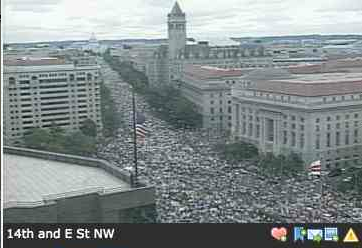 The above is a screen capture of the video showing the marchers, on a wider street, extending all the way from the White House to the Capitol. 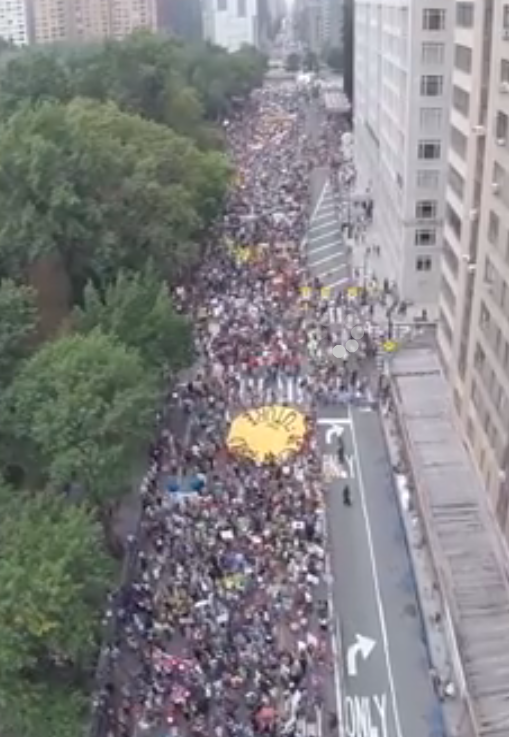 If the (hopefully objective) DC Police said this was 300,000 than the Climate March had maybe 50,000. That said, if someone wants to forward other photos of the size of the crowd, I'd be happy to revise this estimate. 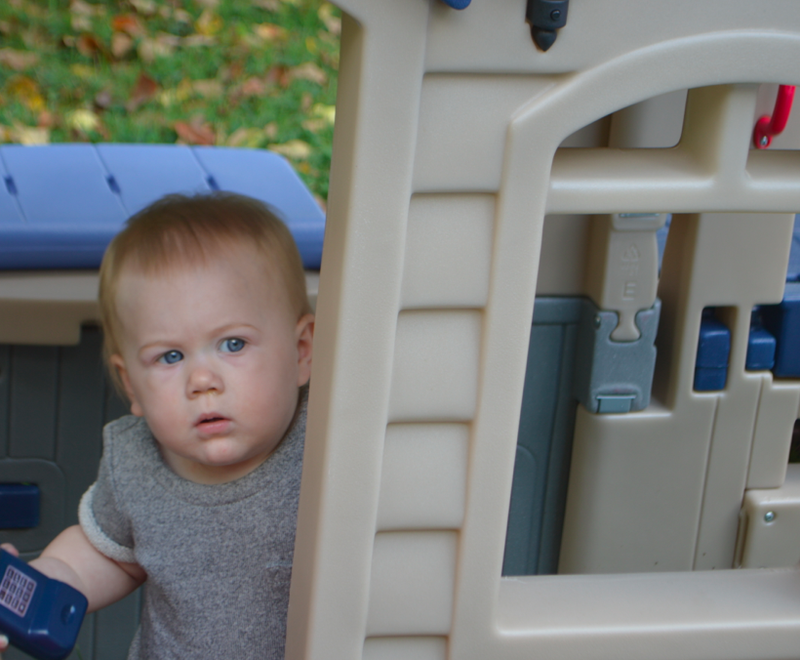 Matt Briggs has coverage on his blog that is both witty and accurate. He says he will be posting throughout the day. Science is supposed to be unbiased and only interested in the truth -- defined as provable facts. So, what type of 'science' organization runs ads like this? AGU sponsoring a "climate ride"! 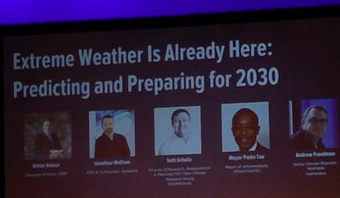 The American Geophysical Union is fully on board with catastrophic global warming. And, they make money on it. As I have asked a number of times in the past, with all of these organizations making (in some cases literally millions) money from global warming there is zero institutional motivation to question -- let alone disprove -- catastrophic global warming. The west Antarctic ice status is fiercely contested. I don't have the expertise to know who is right. But, that is an editorial comment (fair enough, it is an ad) not a "science" comment. And, since it is pro-catastrophic global warming, that particular article is free. There is a substantial fee (often $30-$40) for other articles. Nothing like subsidizing a particular point of view. Seems like the antithesis of science to me. If you really want to understand where we are with climate policy, all you have to do is watch this video. Judy does a terrific job. While recommending the video, here is her column on the subject. Finally! And, they've lowered the price. In addition, they have released the ratings not accompanied by reviews. Wow, 5-Star rating after 62 reviews. That is amazing and I am deeply humbled. If you haven't read Warnings please consider it. 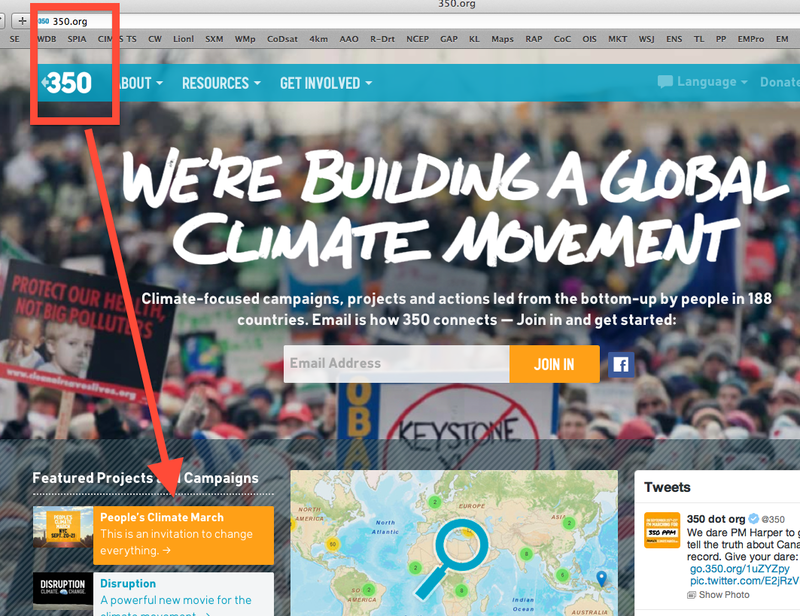 Yes, 350.Org is a Sponsor of the "People's Climate March"
I don't know why people doubt that 350.org, the people who think global warming caused the tragic events in Ferguson, are sponsors of the People's Climate March in NYC. All it takes is one look at their home page. I suspect there are a lot of deniers out there who would like to think the march is about science rather than politics. All of the evidence indicates it is entirely about politics. You may think that is a good thing or a bad thing. It is also an inconvenient reality. Right here. I disagree with several of the author's points (comment below) but it is a balanced, well-stated article. One point is worthy of comment. There are times I feel we are not even having the right conversation. In the article, the question is raised about what percent of our (always) changing climate is due to humans. While that is worthy of investigation, in the end it doesn't matter. We need to make our society more resilient to extreme weather regardless of the cause. While there is no evidence of this, assume one tornado in 100 is caused by human-caused global warming. That humans "caused" it doesn't lessen the need to be in the basement, to have insurance for your home, and to have built the home with some inexpensive fortification techniques to begin with. In addition, I wish to clarify my thoughts on the energy issue. A colleague two weeks ago was chiding me for my lack of support for wind energy (he mistakenly thought I didn't support solar, I do). I replied that it is not about "support," it is about economics. Make solar and wind as reliable and lower the cost to equal or less than conventional power and I'm 100% in favor of it! I'm in favor of cheap, reliable energy regardless of the state of the climate. On that note, have a great weekend!! While more than a foot fell in a small area of southeast New Mexico and west Texas, this storm has not behaved as I thought. 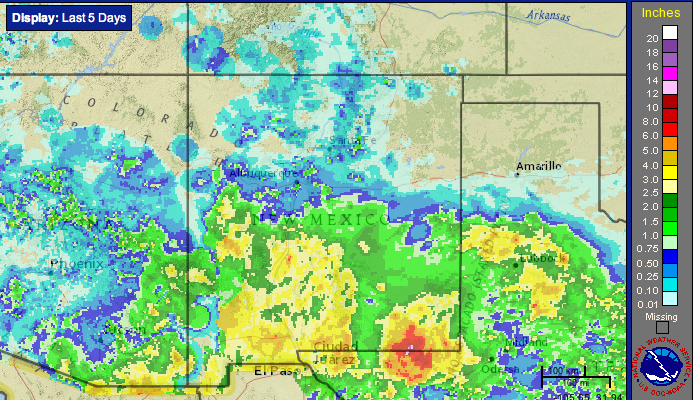 I certainly over-forecast rainfall amounts in southeast Arizona. 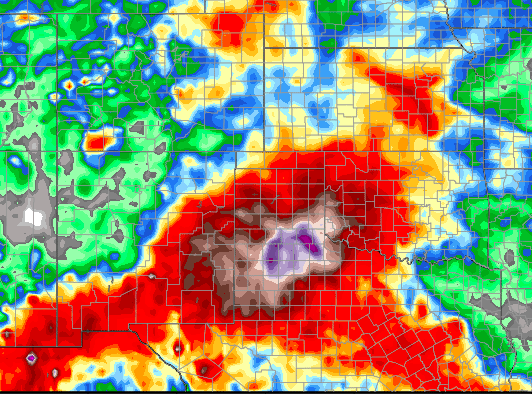 More rain is on the way and flooding is quite possible in parts of west Texas that were experiencing a severe drought at the start of summer as storm totals in some areas would be in excess of seven inches. Mike and I will be visiting National Harbor, Maryland this coming week to attend the 2014 NAMIC Annual Convention at the Gaylord National Resort & Conference Center. Mike is a guest speaker and will be presenting "Weather Trends" to the audience of insurance professionals. Each convention attendee will also receive a copy of Mike's book WARNINGS: The True Story of How Science Tamed the Weather. To book Mike Smith for your next conference or convention please contact mindy@mikesmithenterprises.com or visit our website at www.mikesmithenterprises.com for more information. 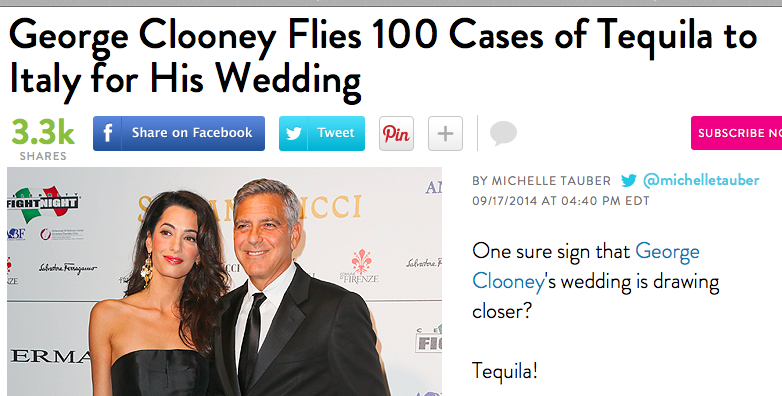 George is doing his part behaving hypocritically by using a private jet to fly liquor to Italy! 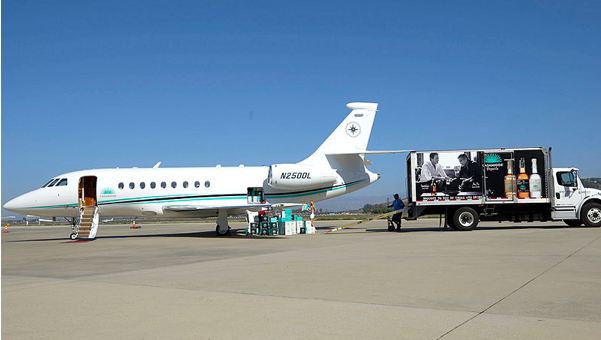 The groom-to-be is a business partner with Casamigos Tequila founder and good friend Rande Gerber, who was photographed loading 100 cases of the brand's award-winning Blanco, Reposado and Añejo tequila onto a jet headed from California to Italy. It is just unbelievable that those who lecture us about "clearing up the earth" because of global warming use private jets to ship liquor across oceans! I'm not sure there is another issue that brings out hypocrisy as much as global warming. 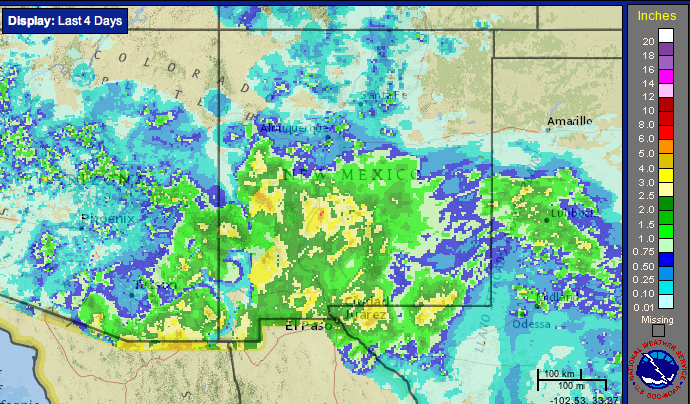 As much as eight inches of rain have fallen in New Mexico with more on the way. 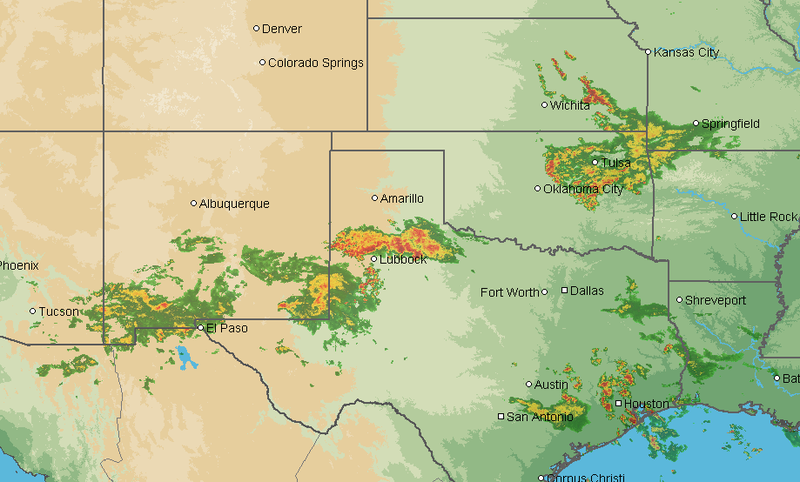 It is now raining from parts of Missouri and Texas to Arizona. 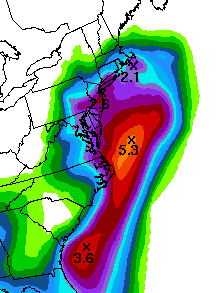 Here is the forecast of additional rainfall. 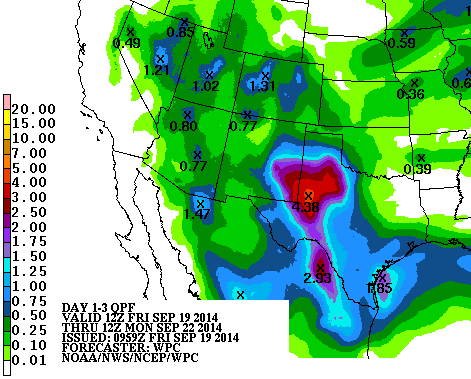 Torrential rains and flooding may occur in west Texas and southwest Oklahoma. 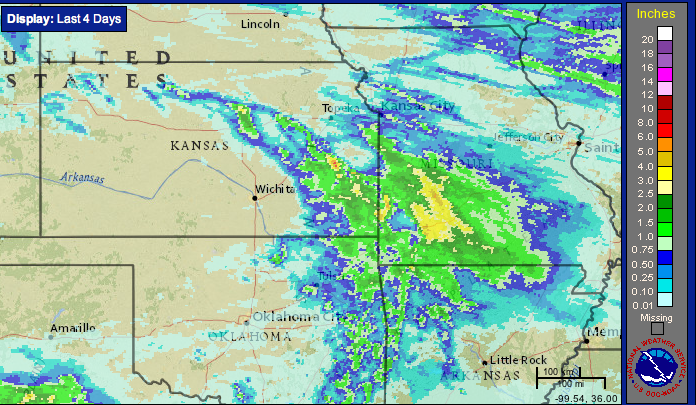 I still believe there will be some spots in Kansas with around 3 inches or a little more. This is a major flood situation. Roads are closed and high water rescues have had to take place. Please use extreme caution in these areas. Amazon: Running Low on "Warnings"
Don't You Hate it When That Happens? Da! The Value of the U.S. Weather Enterprise: Huge!